Interpreting lumber dimensions is one of the first challenges that amateur woodworkers and do it yourselfers face. Lumber dimensions may seem like an accurate estimate of lumber size, but in fact they are frequently quite a bit different from the actual size of the lumber used. This discrepancy in lumber dimensions can make planning projects a nightmare for people unfamiliar with the intricacies of lumber dimensions. Thus, a brief look at how lumber dimensions are calculated will help to decipher the mysteries of lumber size. Nominal - The size given for lumber, for example 2 x 4, 1 x 8, and so on. Dry - This is the actual size the lumber is after it has been dried. A general rule of thumb for softwood lumber is that the lumber dimensions will be about ¼ inch less than the nominal size for measurements below 2 inches, and 1/2-inch less than nominal size for lumber dimensions 2 inches or greater. Green - The green lumber size is the size of the lumber before it has been dried. Green lumber dimensions vary greatly based on lumber dimensions. The length of softwood lumber is generally 1/2-inch or longer than the nominal length, which is done partially to allow for shrinkage during drying. It also allows you some leeway to "square up" your lumber. Hardwood lumber is often sold in varying thicknesses. 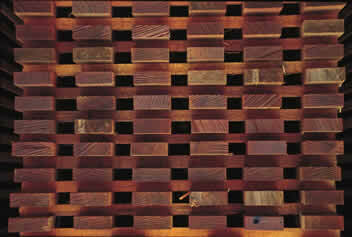 This is done to avoid wasting valuable timber, because hardwood is relatively scarce compared to softwood. However, hardwood is sold in standard lengths, and thicknesses are also for the most part standard. Hardwood lumber dimensions for thickness typically use a "quarter" convention for indicating thickness: for example, 1/2-inch thick boards are called 2/4, while 1 1/2 inch boards would be designated "6/4." Hardwood thickness can also vary from what it is called, although not in the same way as softwood. Hardwood thicknesses are based on a "rough dimension," and vary depending on whether one or two sides have been surfaced. Thus surfaced two side (S2S) hardwood with a rough dimension of 1/2-inch will have an actual S2S thickness of 5/16 inches. Understanding the differences between what lumber is called and what it actually measures out to can help you plan your projects; that is why it is important to learn the ins and outs of lumber dimensions.